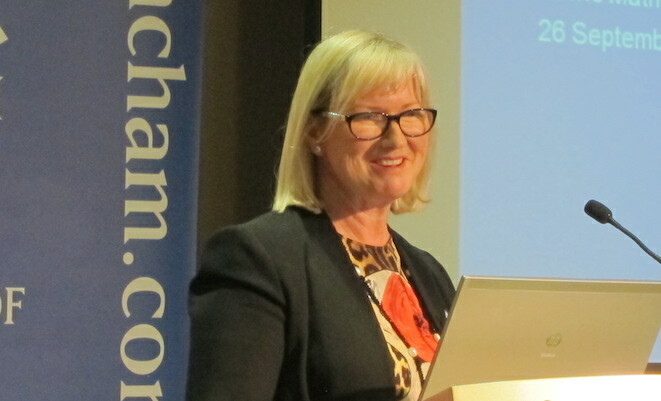 Sydney Airport chief executive Kerrie Mather at a business lunch in Sydney. Sydney Airport chief executive Kerrie Mather says onerous fees and charges deter tourists from visiting Australia and need to be reduced where possible. Mather says the visa requirements for visitors to Australia had not kept up with the changing nature of the nation’s biggest tourism markets, highlighting that while many European passport holders were able to apply for visas online, those from Asia and the Middle East were forced to pay up to $200 and wait weeks for their visa. “In an era where real airfares are falling and low-cost carriers are offering fares as low as $300 to Sydney, why are visitors still charged nearly $200 in visas and other charges and having to wait four weeks,” Mather told a business lunch in Sydney on Friday. The federal government on September 17 announced a review of the passenger movement charge (currently $55 for all international passengers) as well as visa application and import processing fees. Government figures showed border agencies collected about $3 billion in fees and charges each year. Separately, Mather says some of the conditions placed on the airport’s operations such as noise sharing and the calculation of its 80 aircraft movements per hour cap in 15-minute blocks hindered airlines’ ability to keep to schedule and resulted in flow-on delays at Melbourne and Brisbane. “I want you to look out the window. You can see there is no one in front of us, there is no one behind us the airport is empty. But why can’t we move? We can’t move because actually we’ve hit the 20 flights in 15 minutes so we are going to burn through 150 kilos of fuel while we sit here,” Mather quoted the pilot as saying. Mather said the airport was “100 per cent committed to and looking forward to working with the government” during the nine-month formal consultation period on the proposed Badgerys Creek airport that was due to begin next week. Sydney Airport obtained a first right of refusal to operate any second airport within 100km of the existing facility when the airport was privatised in 2002. Is Etihad’s James Hogan aviation’s most influential Australian? Kerrie, should check the visa web site. For A$20 you can get a visitor entry permit on line for a 12 month visit. This applies to many countries. NZ’s do not need one. Bit rich (pun intended) coming from the CEO of one of the most expensive airports in the country to operate to! I’d prefer if airport CEO’s stuck to running airports not providing suggestions to government on border security. Kerrie should be focusing on calls to government to remove the ludicrous movement cap and lift shoulder curfew restrictions to stage 4 jets. ‘A better outcome for the community’ would also mean not conducting works on all three runways (16L/34R, 07/25 and at the northern end of 34L/16R) at night when conditions preclude landing 34L, forcing MEDEVAC aircraft to divert to YSBK or if they are international flights YSCB .